A new contender for world's tallest man has been discovered in China, after he attended hospital for surgery. Zhao Liang was measured at 2.46m (just under 8ft 1in) by doctors in Tianjin, where the ex-basketball player was being treated for a foot injury. It puts him 10cm (3.9in) above the official title-holder, Chinese citizen Bao Xishun, who was first recognised by Guinness World Records in 2005. Mr Zhao, 27, is now seeking official recognition of his huge stature. Until Mr Zhao is independently measured by judges from the Guinness team, he cannot be officially considered the world's tallest man. 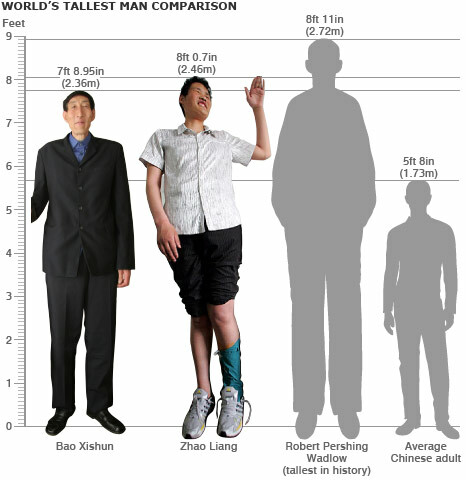 The current holder, 57-year-old Bao Xishun, stands at 2.36m (7ft 8.95in) tall. Zhao Liang's career in his home province of Henan was cut short when he injured his foot a decade ago, state media reported. He was unemployed until 2006, when he started working with a street art troupe and learned to perform magic tricks and play instruments, according to Xinhua news agency. But the 27-year-old caused a new stir when he walked into the Tianjin hospital, and staff there took his measurements. Doctors also performed an operation on his foot and said he should make a full recovery within two months. Mr Zhao does not reportedly suffer any health complications related to his height. However his parents - who are of average height - have other concerns. "I am so worried about his marriage, job and his health that my hair has turned white," his mother, Wang Keyun, told Xinhua.